Offers > IBM > Could your data center network do a better job supporting new technologies? Could your data center network do a better job supporting new technologies? Increasingly demanding IT requirements are necessitating change to the data center network (DCN). Like servers and storage, the network needs to evolve to deliver the flexibility and scalability required by a more virtualized IT environment. 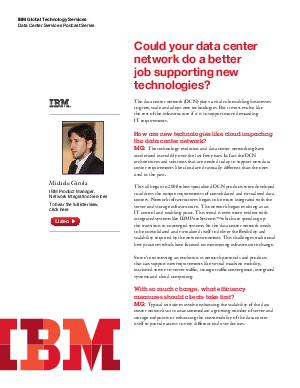 In this interview, Michele Girola, IBM network integration services product manager, explains how to enhance your DCN to support evolving technologies today and in the future. Listen to the full 12-minute interview or read the two-page abbreviated version to learn how IBM is working with clients to build a better data center network.